Camp Ashford was built in the summer of 1942 by Italian POWs, who stayed at the camp until the German prisoners arrived the following year. German prisoners of war were moved into Camp Ashford at White Sulphur Springs. This was one of two POW camps in West Virginia during World War II. The other was at Camp Dawson in Preston County. Camp Ashford was built in the summer of 1942 by Italian POWs, who stayed at the camp until the German prisoners arrived the following year. 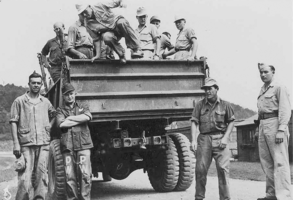 The German POWs stayed at Camp Ashford until the end of the war, when the camp was shut down and The Greenbrier was restored into the resort that tourists know today.